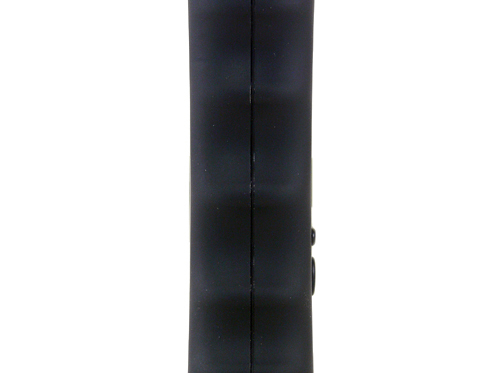 The new VV Gripper from Smok Tech is a useful addition to the company’s growing line of electronic cigarette products. It’s a lightweight but powerful alternative to the more popular tube style advanced personal vaporizer (APV) and comes at a very reasonable price. I recently purchased this device from Madvapes for the purposes of this review. It came boxed in an simple yet attractive flip top box with a manual. The obvious design characteristic of the Gripper is the boxy shape with a scalloped edge. The test model came with a black rubberized coating that makes it easy to hold. The unit is made of plastic which makes it exceptionally light at only 2.85oz. This light weight gives an initial impression of cheapness which is not helped by a small gap between the two sides of the housing. 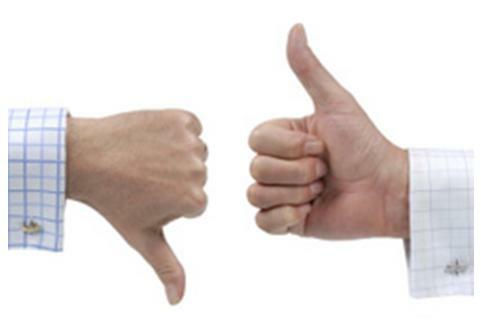 Overall build quality appears very good, however, with no rough edges, rattles or blemishes. Even the gap between the sides is even all the way around the unit, making it seem like part of the design rather than a flaw. A multi-function On/Off switch and voltage setting buttons are found on one side of the unit beneath the LED display while a round grill for venting is on the opposite side. 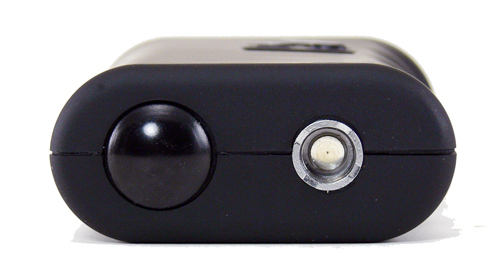 The fire button is found on top beside the 510 atomizer connector. 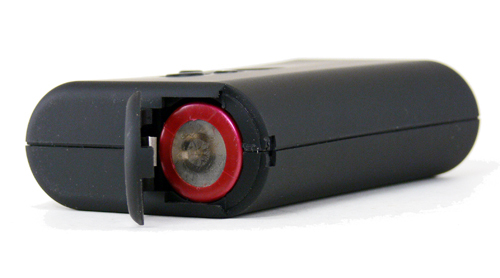 A sliding door on the bottom provides access to the battery compartment for the single 18650 battery. The On/Off button serves a couple of purposes. Clicking the button rapidly 5 times turns the unit on and off and the fast rhythm needed takes a little getting used to at first. The unit defaults to off when the battery is removed, so turning it on for the first time can be a slight challenge. Pressing it once turns on the LED display, which reads the atomizer resistance for 5 seconds and then switches to battery voltage. The button is back lit by a blue LED when the power button is pressed. The function of the voltage up and down buttons is simple, with a press of each increasing or decreasing the voltage by .1 volts. Removing the battery resets the output voltage to 3.0v. The fire button on the top of the unit engages with an audible click and requires just the right amount of force to press. As with the other plastic components, the button feels a little cheap, but fulfills its intended purpose with no problems. The placement of the fire button and the scalloped edge of the device are designed so that it can be held in a closed fist, but I found the button to be a little awkward to press when all four fingers were in the grip position. Moving my pinky to the underside of the device made it a lot more comfortable to hold and use. The VV Gripper has proven to to be quite a solid performer in the week that I have used it. 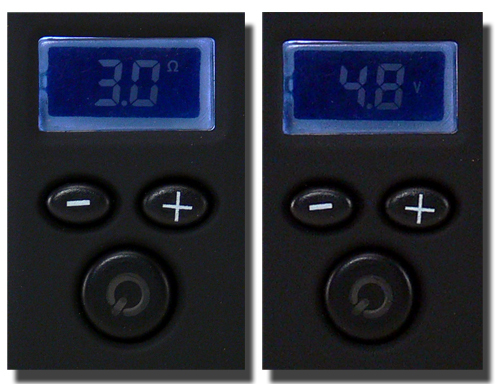 The output voltage is nearly identical to the set voltage. Unlike some other inexpensive variable voltage devices on the market, the advertised 3v-6v output voltage is actually what is delivered under load. Only when using low resistance cartomizers at higher voltages were any drops in voltage noted. The advertised limit for the VV Gripper is 4 amps and that seems just a little optimistic, as I started to see a voltage drop at around 4.5 volts with a 1.5ohm cartomizer. That’s over 13 watts, though and plenty of power to deliver a great vape and even a hot one if desired. Battery life is also great thanks to the 18650 battery. This size of battery is typically rated at over 1500mAh which provides a lot of use between charges. The boost circuitry in the VV Gripper appears to be pretty efficient, as the device housing does not get hot during use. That efficiency translates into well over a day of moderate vaping on a charge. 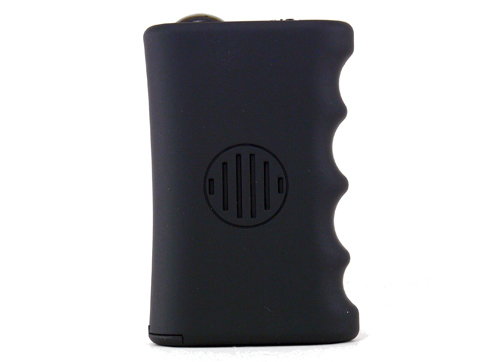 The weight and shape of the VV Gripper make it a very comfortable device to carry in a pocket or purse. The unforgiving 5 rapid clicks required to turn it on work to its advantage in this case, ensuring that the device does not get accidentally activated. At $59.99 from Madvapes, the VV Gripper is at the low end of the price spectrum for variable voltage devices and is one of the cheapest available that delivers full voltage under load. The plastic body feels a little cheap at first, but the solid construction quickly becomes evident. The device is easy to carry and pocket friendly, but the grip design may be uncomfortable for some. Smok Tech probably has another winner with this inexpensive and practical device.